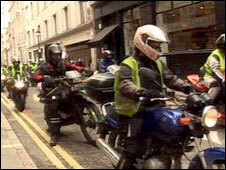 Motorcyclists have disrupted traffic by riding slowly through central London in protest at parking fees. Since August motorcyclists and moped riders have been required to pay £1.50 a day to use West End parking bays. Around 100 bikers rode from Golden Square around the West End as part of a campaign to have the fees withdrawn and for any fines to be refunded. A Westminster City Council spokeswoman said the parking fee scheme would not be abolished. The No To Bike Parking Fees campaign group describes the scheme as "a dangerous piece of anti-biker legislation" that "seems totally contrary" to the city's anti-congestion initiatives. Spokesman Warren Djanogly said: "We can create havoc if that's what we want. "We don't cause congestion but if that's what Westminster wants us to do to prove a point, that's what we'll do." A council spokesman said the changes were needed to meet an increased demand for motorcycle parking following the introduction of the congestion charge. He said the number of parking spaces for motorbikes in central London increased from 4,500 to 6,400 and new security stands were installed. On average about 16,000 motorcyclists ride into central London every day, up 40% from 10 years ago, the council spokesman added.